Everything at a glance: With the Weekly Planner by Design Letters, all dates and events of the week are clearly collected. 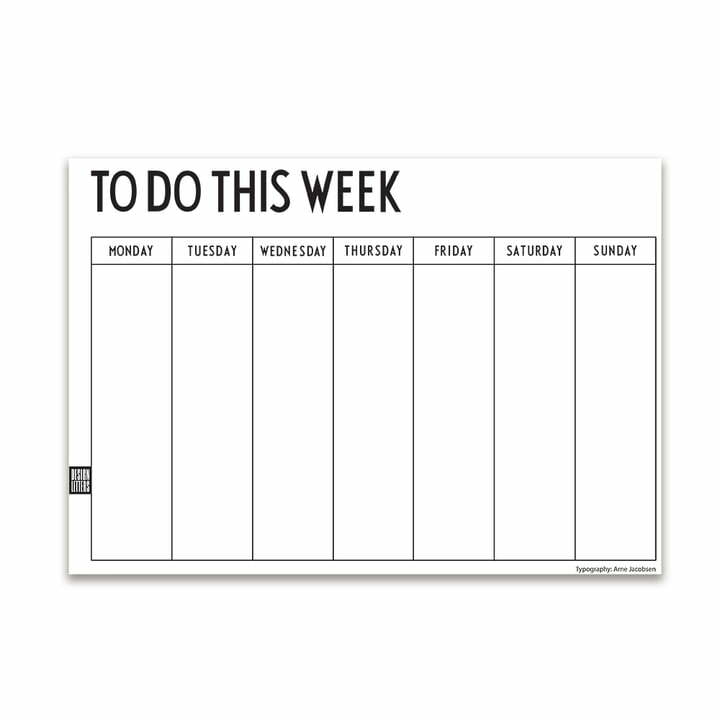 A total of 60 pages in DIN A4 format can be hung in your office, in your kitchen or above your desk. The to-do list by Design Letters is designed in a clear manner. A column for each day of the week: from Monday to Sunday and enough room for all kinds of notes. Appointments, deadlines or household tasks - everything that is scheduled for the week may be entered in the Design Letters list. As part of the Office collection, the Weekly Planner delights with a modern typography designed by Arne Jacobsen. He already designed the letters in 1937. Originally created for the internal labelling of the Aarhus City Hall, the letters, numbers and characters now decorate various accessories, tableware and textiles by the manufacturer Design Letters.